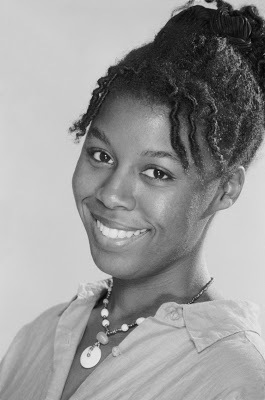 We’re so VERY excited to introduce YA author Sherri L. Smith! 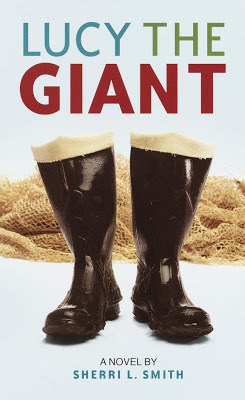 Sherri is the author of Lucy the Giant, a novel about a tall girl from the immense state of Alaska who tries to lose herself and her past in the wilds — and finds out what it means to have someone care enough to find you. Lucy’s story was Sherri’s first novel, and one of our all-time favorite Under Radar Recommendations from last summer. 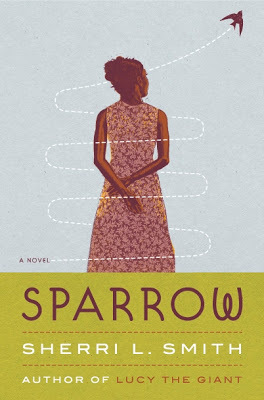 Sherri’s other novels include the 2009 Louisiana Young Readers’ Choice Award nominee, Sparrow, a novel about a young woman coming to terms with losing her “real” family and taking the risk to create her own. Sherri’s most recent novel is today’s highlighted middle grade title, Hot, Sour, Salty, Sweet. Ana Shen’s incredibly stressful, terrible, horribly funny 8th grade graduation day is filled with too much family, too little time, grudges, grumpiness, growth and acceptance — and a little bit of romance, too. Hot, Sour, Salty, Sweet lands in bookstores today! Sherri has graciously agreed to be our guest blogger today, and A. Fortis and I are happy to join the conversation. We encourage you to join in, too, as Sherri has graciously provided us a copy of her book to give away in a random drawing! We’ll be choosing one name at random from all those who comment, so don’t forget to take your chance! And now for the good part! Last fall, I taught my first writing class at a local university extension program. Several of my students asked me if it was okay to write outside of their ethnicity. Could a white woman write a convincing Latina pre-teen? Should an African-American woman write about a white girl, or for that matter, a white boy? As an African-American woman about to publish a novel about a Chinese-/African-American girl, my answer on all counts was “Yes, yes, yes!” This class of mine witnessed the birth of several young adult novels that will no doubt one day be sold as “multicultural.” But, let’s get one thing straight—multicultural is a made-up word. The proverbial “Great American Novel” by its very name is a multicultural novel—America is made up of too many different peoples for it to be otherwise. It’s something that really hits home for me, too, as someone of (VERY) mixed ethnicity. I sometimes feel self-doubt about what sort of characters I “can” or “should” be writing about. And if I’m only “allowed” to write what I know, is it really authentic for me to write about either white European-American culture OR Pakistani-American culture when I never quite felt entirely at home in either? Can I write about Costa Rican families because of my stepfather? Aussie families because of my half-sister, or Chinese-American families like my husband’s? It’s a mixed blessing that “multicultural” has become a buzz word in kid lit in the past few years, as if suddenly (suddenly!) the cleanly segregated masses started interbreeding and now we have to contend with this new species called “other people.” What will “they” read? How will “they” relate to society? Who will write for “them”? The fact is the faces of young adult readers have always come in many colors, even if the protagonists have not. The multi-ethnic audience is nothing new. It is a shame that the industry pretends otherwise. While racial bias has always existed in Western literature (ever notice how ethnicity is often only a descriptor if a character is not Caucasian, making White Anglo Saxon the default for most characters? ), at least there is now a forum for discussing it and a movement toward more diversity. Tad: Hah. I love that “Suddenly.” Suddenly we’re left with, oh dear, the faceless “them.” It really is ironic that suddenly multiculturalism is popular, even as it’s also “othered” to the extent where it seems to merely underscore that “multicultural” means “not like me.” It’s almost just an additional minority group. AF: It’s certainly not a bad thing to move towards more diversity in literature, and there is a place—an important one—for writing that discusses these topics themselves and lets readers know that it’s okay and normal and even good, sometimes, to worry about racial and ethnic and cultural stuff. So, if the publishing industry has been ignoring the diverse make-up of readers until now, how is it that people from all over the world have been enjoying the exact same books for years? I’m not talking about today’s heavily-marketed, printed-in-30-languages blockbusters that are specifically created to pre-sell worldwide. I mean the longstanding, tried and true novels written when the world was a bit smaller, certainly less accessible, and nowhere near as ethnically-blended as it is today. Books like J.M. Barrie’s Peter Pan or, Jane Austen’s Persuasion, or my personal childhood favorite, E.B. White’s Charlotte’s Web. Answer this question, and you have the secret to writing for a multicultural audience. Okay, I’ll give you the answer—don’t write for race, write for people. My favorite definition in the world is for the word “humanities.” You know, the classes in high school and college that cover literature, art, music, history and dance? The definition is “that which makes us human.” That’s as multicultural as you can get, and as expressive. My novel, Hot, Sour, Salty, Sweet is about a girl who is both Chinese- and African-American, but first and foremost it is about a 14-year-old girl with a crush and a family that drives her bonkers. Sound familiar? Even if you aren’t biracial? AF: I just love this, and it’s so tellingly sad that the humanities are often the first to go when there are budget cuts in education…what then happens to our perception of ourselves as human? Of others? Of what it means to be human? Tad: And even as I agree SO wholeheartedly with this (and YAY, Persuasion! ), I find that it’s very tricky. Maybe I’ve never had to “deal” with race and ethnicity within myself — accepting my own hybridized African- and – Greek and Choctaw American has left me more open to the idea that even if it isn’t readily apparent, we’re all made up of more than one race or culture. Since my work is now scrutinized by more eyes than my own, though, I find that I get… nervous about how the race of my characters is perceived. I’ll never forget being asked by another student during my MFA program why I wasn’t “representing.” Seriously, someone wanted to know why my characters weren’t “more African American.” Who knew there was a gradient scale! One of the reason that YA literature has had such a great appeal for me is that it uncovered the commonality of the human experience. It reminded me that everybody is ashamed, giddy, looks foolish, feels stupid, can’t sleep, gets acne or burps at inopportune times, or is so happy they feel like they can’t contain it — sometimes. We are all siblings under the skin at least once or twice a day, because humanity has some common denominators, despite its various outer wrappings. If you write true emotions, all readers will be able to relate to them. Will you have critics? Undoubtedly. But don’t let that stop you. If the community you write about takes issue with your work, the challenge is for them to write their own stories. Encourage your critics to tell their own truths, and help you to develop a better understanding of their world. Do your research, be truthful, insightful and as accurate as you can be when writing another culture, and undoubtedly the strength of the story will shine through. Don’t let the color of your skin, or the pronunciation of your last name, keep you from writing outside the “Check one” racial identity box. We are human. We are multifaceted, and that is all the “multi”culture you need. AF: There’s so much strength in this idea. What better way to learn about others than to teach each other, to go out there and read and research and learn? Someone’s got to be doing that research and writing, helping others learn—and the more, the merrier. Sherri, I’m so glad that you communicate such positive and constructive messages to your writing classes. It’s much more conducive to creativity and learning than insisting people stay within that “check one” box. Tad: Exactly. I can only hope to encourage other people through my own work to step out there and find out about their own and other cultures and groups and open up dialogue about their discoveries. It really opens up worlds of potential to think that you have the right to write well any story that you choose. That’s awesome. Sherri, thank you for stopping by. We’re feeling inspired by our conversation about ethnicity, race and writing, and we’re grateful you agreed to chat with us today! February 28, 2008 @ The Brown Bookshelf. Don’t forget to join the conversation! 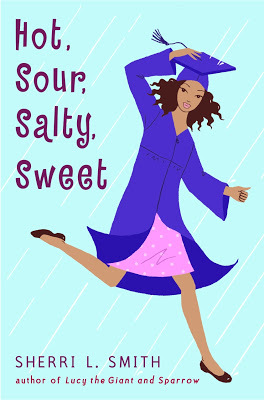 Jump in with your thoughts and become eligible to win a copy of Hot, Sour, Salty, Sweet. And don’t miss these other thoughtful reviews of Sherri’s work. New Year’s Rat courtesy of A. Fortis. Poetry Friday: What’s a spoonful of sugar when you can have a pinch of arsenic? This is a wonderful post. Thank you, Sherri. So thoughtful. Can’t wait to read your books! Don’t have much to add–I think you guys covered it all! Yes, thanks for sharing these perspectives. I’m not a writer, but “write what you are”? I’ve never understood that. To take that to an even more ridiculous length, I suppose that means only vampires could write vampire books, only werewolves can about werewolves, and absolutely no historical fiction because unless someone’s got a supersecret time machine, how do they know what the era was really like? Plus, obviously there is no one Asian-American experience or African-American experience, etc. A non-Asian writer could very well write a novel that’s truer to my life as a 4th generation Asian-American born and raised in Hawaii than a 1st or 2nd generation Asian American who was the only Asian kid in school or a person who was adopted from China. Exactly, Trisha! Nicely put. It’s funny, but when you brought up historical fiction it reminded me that my husband really does not like historical fiction for just the reason you stated–for him, he says it’s almost always going to be too anachronistic and he can’t enjoy it! I see his point, but…I don’t know. It starts to turn in to a philosophical slippery slope. This was a really, really great post. I enjoyed it lots. Brava! Amen, Trisha. Although it would be a good way to flush out all of the vampires! Seriously, thank you for your comments everyone. This is the forum of discussion I was talking about. It’s great to see that people are actually thinking about these issues. Talking about them is even better. Cheers. I’m still just sittin’ over here swooning about the humanities. This was such a great chat, you all. Thanks! This is a really great post. I appreciate the freedom encouraged here. But I have to admit I would still rather read a story featuring main characters that are People of Color and where the author was the same ethnicity as the main characters. Maybe that’s my bias, but I think it’s because for so long People of Color have been shut out of the publishing industry. I am tired of reading books by white folks. I am white myself but I feel I’ve been blinded and my world has been kept narrow by our racism. We all have a unique experience. So if you are first generation, or third generation or whatever, you ought to start with what you know. It just seems to me that if you are researching a culture you don’t know intimately from your own life you are going to get some things wrong and miss some things. I’d rather read a good story coming from the author’s own experience. Sometimes I want to read a life just like mine, and sometimes I want to see something completely new to me. But I want it all to be genuine. The word ‘genuine’ is a difficult one. I can see your point about being tired of the world being written from the perspective of the dominant culture — that’s why Sherri and a. fortis and I are writing. BUT. As soon as one applies an entrance criteria – other than the work itself – as validation, you’ve introduced censorship. I’m not writing to gate-keep. I’m writing to create worlds and people them with characters I enjoy and share them. I am not trying to be the African Greek Choctaw French American Ambassador. I can only share what worlds I inhabit, whether in my imagination or in reality. I am not sure I agree with you about “multiple ethnicities (that you know of, and that influence you).” While I’m not a fan of cultural appropriation, I’m not sure the cultures have to have influenced you in order for you to write about them. Once again, there is no “authentic” African American or any other kind of minority experience but one’s own. Do you also believe only women should limit themselves to writing female characters? If they’re healthy, are they allowed to write a character with diabetes? I had fun playing with the valentine’s candies on your site. Mine said “Makes Stuff Up.” That’s the calling card of the writer. As I’ve always said to everyone, if you do cross cultures, genders, faiths, age, political ideologies, body types, IQ, etc., etc., etc., just create characters, not caricatures, and you’ll be miles ahead of the game. Ooh, thanks for that Trisha — I really love his work, and he truly has successfully navigated something that could be tricky for a lot of writers. It’s a little hard to avoid white folks when you’re reading literature written in English…[which] takes me back to your comment about the person at Mills who expected you to “represent” more. When you’re expected to represent, it’s awfully creativity-stifling–I’m not sure it’s possible (it’s surely not easy) to have an agenda that’s about representing AND tell your own story. There is a difference between ‘genuine’ and ‘authentic’ which should be pointed out here. If we mean genuine in the sense that there ought to be a criterion of ‘made by an authentic member of X racial group,’ then we’re in deep trouble. If we mean genuine in the sense that the work itself contains truth, then of course works ought to be genuine (by ‘truth’ I intend the broader meaning of the word, as opposed to mere fact). Everyone aiming at truth will achieve some greater or lesser representation of it, depending upon skill and familiarity with the particular truth they’re attempting to portray. Thus, in some ways it is easier for an author to ‘write from what they know,’ as they’re familiar with their own subculture. In some ways, though, it is not as easy to write what they know, unless they’ve taken the time to analyze their particular subculture, and to honestly consider what preconceptions are held, what values are held, etc. This, though, is in consideration of ‘genuine’ as opposed to ‘authentic,’ as I have distinguished the two above. The complexity of this issue is part of what makes it difficult to judge works as they stand on their own (as to their degree of genuineness); to introduce concepts of authenticity into the discussion is to take the discussion out of the realm of literature and into the realm of censorship, race relations, sociology. If we do that, we must ask ourselves whether Truth is being served, or whether Truth should be stifled in the name of some other Good. If there is some higher Good, I certainly do not see it. As I read this very interesting post, I realize that there are many of us who are accustomed to walking with our feet in two worlds (or more….okay, mathematically impossible, but you know what I mean). As a former Southerner now living in the Northeast, I think about ideas like this a lot. (Life is rough without Finding Wonderland every day. I’ve missed my blog-reading). Aww! Jules, the beauty of the internet is that all this nonsense will still be up here years from now when the girls want to be doing their own things and you have time and peace to read… Enjoy the now. You’ve all taken me to task and you are right. I don’t mean to say one can only write from one’s own identity. I wouldn’t want to limit anyone to just one perspective or experience. Many wonderful authors have written great books far beyond what they have lived themselves. “Genuine” wasn’t a very good word to use. “Authentic” is much more what I meant. “Honest” is good.. but from one’s own experience is what I want I think. I just meant I personally would rather read a story with main characters from ethnicities other than my own and that was written by a person of that same ethnicity. Perhaps it is a phase I am going through. Maybe later in my life I won’t care so much. Maybe I will get beyond this narrow focus. Right now – I am tired of the white man’s perspective. I’m looking for great books written by Black, Latina, Asian, Native American or whatever women. Their own stories. I don’t think there is enough of that published. I don’t expect the author to Represent the whole race or anything. I don’t think a book by a Black woman is the only word on Black Culture. I feel really hungry for a whole cornucopia of stories that tell all the variations of the lives women live. And yeah, my own bias is I don’t think a White Man can write those stories. Maybe I’m wrong about that but I am not willing to spend time testing the theory by reading white men’s books anymore.